Within a matter of hours the first show of Destino Eurovisión is going to start. The twelve participants will perform hits from the Eurovision Song Contest. You can watch it tonight at 22:15 CET on TVE-1 where the artists will sing songs like Fly On The Wings Of Love, Wild Dances and Non Ho L’Età and of course several Spanish entries. 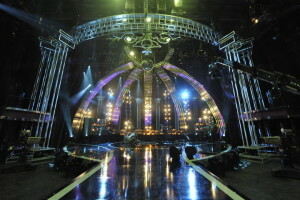 Twelve candidates, half of the selected ones, will battle to become one of the five singers to qualify for the semifinal. The first rehearsal on the spectacular stage took place yesterday and everything is ready for an evening full of surprises for the viewers. The show, that will take place in San Cugat del Vallés (Barcelona), will be presented once again by Anne Igartiburu, and Daniel Diges, 2010 Spanish representative, who will be reporting from backstage. There will be a four-member jury, with an important role, composed by the singer and songwriter Albert Hammond, Eurovision Song Contest expert Reyes del Amor, popular television personality Boris Izaguirre and the singer and songwriter Merche.